A minor Hollywood sensation has been caused by the suit which Alberto Guglielmi and Maria Strade brother and sister of the late Rudolph Valentino have filed against George Ullman. They charge Ullman with mismanagement of the estate and diverting large sums of money for his own use. Ullman, in the answer he has filed to the charges, says that, far from mismanaging the estate, he found it in a debt-ridden condition and spent years ironing it out. It was Valentino who wrecked his own estate, Ullman claims, for he died leaving debits of over $60,000 into a surplus of $100,000 to be distributed among the heirs. A court hearing will take place at the end of this month, and a decision reached as is whether Ullman shall be permitted to continue as manager and executor of the estate. Ghouls, It Is suspected, have planned to steal the body of Rudolph Valentino for commercial reasons. 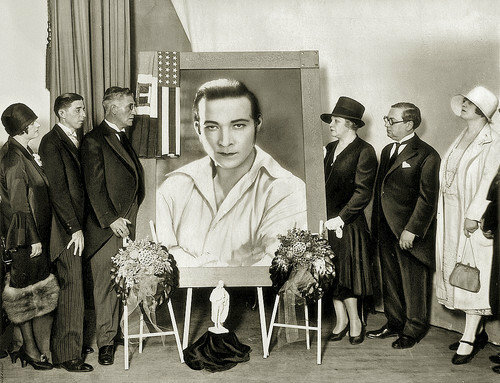 Five men were recently discovered by a florist attempting to break into the crypt containing the embalmed body of the famous film star, says the Hollywood correspondent or the London “Daily Express.” Death has failed to free Rudolph Valentino from his admirers. Men and women have chipped pieces from! the vault In which his body lira. A marble pedestal has been broken and its chip cold as “Valentino Souvenir.” Visitors to the Cemetery have been restrained from crawling through the stained-glass window two feet from the crypt. And a woman living in the heart of United States recently divorced her husband because he would not let her live near the Valentino Mausoleum. The name of Winifred Shaughnessy, used by the second bride of Rudolph Valentino, whose wedding at Mexicali, Mexico, last Saturday prompted the investigation now under way, is her real maiden name, it has been learned from her friends. She is the step-daughter of Richard Hudnut, the NY perfume manufacturer. Her mother, formerly the wife of a Salt Lake City man, later married Edward de Wolfe, brother of Elsie de Wolfe. The De Wolfes, went to San Francisco where Winifred’s mother became an interior decorator and a year ago she married Richard Hudnut. Winifred at one time attained popularity in the Metropolitan Ballet of New York, and later went to South America with the Kostoffs in a dancing act. More recently under the name of Natacha Rambova she was an art director in motion pictures at Hollywood, in which occupation she was engaged at the time of her marriage to Valentino. On 15 Apr 1875, Cornelius Bliss Jr. was born and raised in New York City. When his father died he left an estate of over $4million of which he received $1,377,935. Cornelius followed his father into politics. 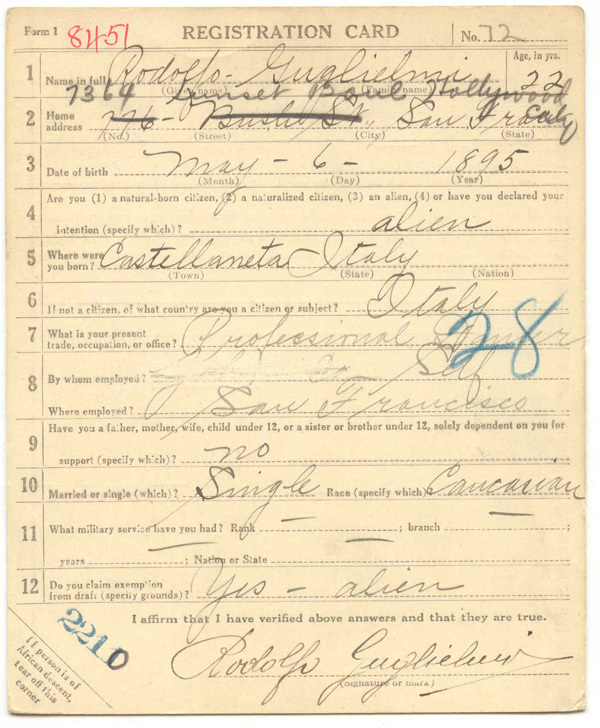 In 1897, he graduated from Harvard. On 23 Dec 1913, Rudolph Valentino arrived in New York. Rudolph had a degree in Science of Farming from the Royal Academy of Agriculture. In 1914, through the help of the Commissioner of Immigration, he gave Rudolph Valentino a Letter of Introduction to Cornelius Bliss, Jr for a job as an apprentice gardener on his Long Island estate. Cornelius wanted his grounds landscaped in Italian. Subsequently Cornelius Bliss hired Rudolph Valentino. Rudolph felt this job was beneath him. Rudolph would study the manners of the rich and famous and because of this he often neglected his work. Rudolph wrecked Cornelius’s motorcycle when he crashed it into a tree. The crashed was caused because Rudolph was very near-sighted and could not see far enough ahead to drive safely. Rudolph was called into Cornelius’s presence and was told he no longer required his services because he changed his mind about the Italian gardens he initially wanted done. So Rudolph went to New Jersey and worked as a gardener but again Rudolph felt the position beneath him and he quit. Rudolph had no place to go. Therefore, he went back to see Cornelius Bliss about getting his old job back. Cornelius admired Rudolph for his honesty and had set him up with an allowance and training with the Central Park Commissioner. Upon completion of his training Rudolph went to register to take his exam he found out that he needed to be a citizen of the United States. Because Rudolph realized that citizenship was granted after living 5 years in the United States he could no longer accept further help provided by Cornelius Bliss, Jr. So Rudolph Valentino once again, left his employ. In World War I, Cornelius Bliss Jr. was a member of President Wilson’s War Council, and in World War II, was chairman of the Red Cross advisory council on war activities. Also, he was a director of the Bankers Trust Company [since at least 1917] and of the New York Life Insurance Company, and an honorary Governor of New York Hospital. The next time Cornelius Bliss, Jr. saw Rudolph Valentino again, as he became famous was at his funeral. 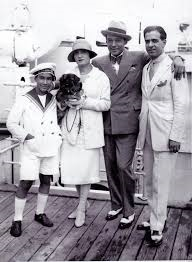 On 27 Aug 1926, Cornelius Bliss Jr. arrived in New York on the White Star Liner Majestic to attend Rudolph Valentino’s funeral. Asked whether he had seen qualities that would make him famous he replied: “My recollection of him was that he was a fine young man.” On Mar 1949, Cornelius Bliss, Jr. died. The “Oak Hill” Georgian Revival Estate (1916) that Rudolph Valentino worked no longer exists.